With the dust settling on the second stop of the Crankworx World Tour, Whistler is ready for the big show. Home at last and ready to break new ground in the sport, Crankworx Whistler will see the crowning of the first King and Queen of the Crankworx World Tour, and one athlete will attempt the ultimate feat, winning every event of the year in his discipline to take the Triple Crown of Slopestyle. “Back in January, we sat down to look for the next frontier in gravity-mountain biking and realised the World Tour is really the future. Every year, the athletes astound us with what they accomplish on the trail, but just as surfing and horse racing have their Triple Crown, and golf has the Majors, we’ve reached a stage where we need to reward consistent performance over outstanding moments,” says Darren Kinnaird, Crankworx World Tour general manager. This new attitude quickly prompted changes in the festivals. A month out from the inaugural Crankworx Rotorua, the new King and Queen of the Crankworx World Tour, and four series disciplines, were unveiled along with a special honour for the marquee event of each festival, the Triple Crown of Slopestyle. “When we hit Whistler, we’ve hit our Super Bowl. It’s as big as it gets and, with the creation of the World Tour, the obvious challenge, to win all three Slopestyle events on the tour and finish the year off with a huge win before the raucous Red Bull Joyride crowd, seemed the ultimate elusive challenge,” says Kinnaird. Right out of the gate, Mount Albert, Ontario’s Brett Rheeder proved the hypothesis wrong. 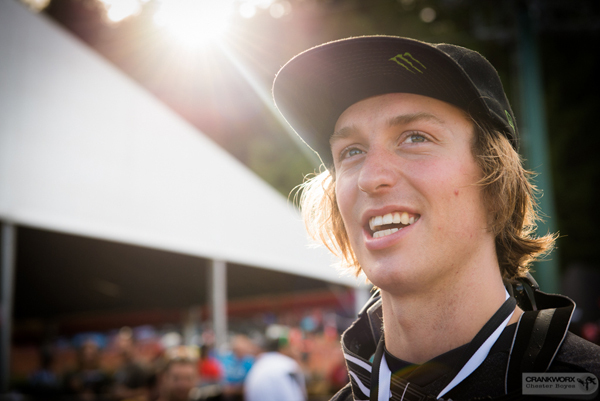 Bringing his A-game to steal the Crankworx Rotorua Slopestyle out from under the grand master of gravity, Brandon Semenuk, he positioned himself as the heir apparent in this young sport and the first rider to make a play for the Triple Crown. By the end of the second tour stop, the dye was cast. Back-flipping onto the course and finishing with an unseen backflip opposite tail-whip off the final step-down, he dominated in Les 2 Alpes with a beautiful 93.25-point first run no one could best. Now heading into Whistler’s event, Red Bull Joyride, Rheeder will shoot for the Triple Crown’s $50,000 prize on a course refined to provide enough flow for the riders to achieve maximum loft and a solid line of tricks. “You kind of want to go into a ramp in an aggressive position, almost a pedal position, so we’ve been dialing that in over the last few years, working on the line of the course and the flow at the base of the mountain,” says Paddy Kaye, course builder/designer and owner of Joyride Bike Parks. This year’s course will include what the riders are calling an Orca on what used to be the wall ride, a wall feature now flipped on its side and tipped to provide an arc and lip like a dorsal fin off the front. Built in Brandon Semenuk’s backyard, it will be the perfect setting for the three-time Joyride winner and Squamish local to defend his status, avoid a Slopestyle strike out and ensure the Triple Crown remains off limits until he has a turn to win it in 2016. Meanwhile, in the downhill world, Bernard Kerr, will face some tough choices in the coming weeks. Having the best season of his World Cup career—he is currently ranked 14th—Kerr must make a choice between coming to the opening weekend of Crankworx Whistler, to stay for the full 10 days of the festival, or attending the World Cup in Whindham, New York. If he chooses the latter, Adrien Loron, who is currently second in the King of Crankworx standings, will be free to gather valuable points at the CLIF Bar Dual Speed & Style and potentially earn the crown. Meanwhile, in the race for Queen, Anneke Beerten appears to be holding court. She was 50 points ahead coming out of Rotorua. Emilie Siegenthaler made a valiant effort to chase her down, scattergun-style, in Les 2 Alpes, racking up a second place in the Official European Whip-Off Championships, third in the Les 2 Alpes Pump Track Challenge presented by RockShox, and third in the Crankworx Les 2 Alpes Downhill presented by iXS, but Beerten remained on top. Now registered for a string of events in Whistler, it will be tough for anyone to take her out, though the possibility is still there. The race for the King and Queen of Crankworx has a $25,000 prize purse for both the King and Queen, and Whistler is where it is all decided.